Supra- and intrasellar tumors constitute 10% of all pediatric CNS tumors and may cause endocrine dysfunction due to their close proximity to the hypothalamic-pituitary axis. Endocrine dysfunction may exist at presentation or can occur after surgical intervention or evolve subsequently during or after completion of chemotherapy or radiotherapy. Apart from pituitary adenomas, which comprise approximately 90% of all sellar tumors, there are tumors or tumor-mimicking lesions of non-pituitary origin occurring in the suprasellar region. These non-pituitary sellar masses can be developmental in origin, inflammatory, immunologic or vascular in nature and are further categorized as benign or malignant. 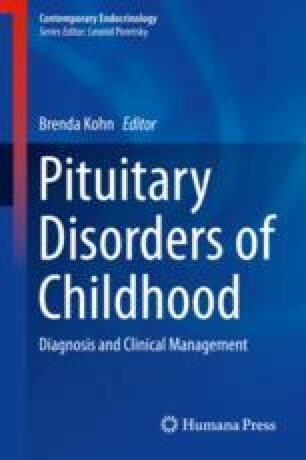 In this chapter, we discuss the clinical and neuroradiologic presentation of non-pituitary supra- and intrasellar tumors that occur in the pediatric population, along with the histologic and molecular characterization of these tumors.